This hymn was written in 1901 after the death of McAfee’s two nieces from diphtheria. His church choir sang it outside the quarantined home of his brother, offering words of hope about God’s heart of care. The apostle Paul tells us that God has a heart of love for us (Rom. 8:31-39). Nothing—tribulation, distress, persecution, famine, nakedness, peril, sword, death, life, angels, principalities, powers, height, nor depth—is able to separate us from the enduring love of our Lord. “If God is for us, who can be against us?” (v.31). Whatever our stresses or concerns, the heart of God is the place to “rest into.” Leave it all with Him, “for He cares for you” (1 Peter 5:7). When you’re weary in life’s struggles, find your rest in the Lord. I was reading Decoding Women’s Body Language, an article on the Ask Men website about women’s body language. There are non-verbal ways in which they show that they are interested in men such as leaning toward the men they are trying to attract and frequently making eye contact. They laugh more often than usual and smile constantly, regardless of whether or not the men they are interesed in are funny. They chew on their lips and their faces become more animated. The more flirtatious women tend to fidget more, doing things like fiddling with their jewelry, twisting rings and tugging at necklaces because they are nervous and excited. Their hearts are beating a little faster than usual, they need some sort of outlet for their tension. Apparently, they may also play with their hair or place their hands on themselves in some small but unusual way, which is an unconscious signal that they wish the object of their desire was touching them that way. My husband once told me about a man who approached a woman at a function and asked her for a dance. She readily got up and went with him, leaving her husband and child sitting there. What gave this man the courage to approach this married woman? Was it her body language? Did she frequently make eye contact with him? Did she give him the “I’m interested” signal? How did her husband feel seeing her dance with a stranger? I wonder if they are still together. When a woman is in a committed relationship there should be no reason for another man to even contemplate moving in on her. This is a boundary no one should cross. The woman has to make it clear that she is not available and she needs to do this with her body language. It’s no point saying that she’s not interested and yet, she is telling the man the opposite with her body. Just recently my husband and I watched “Duel in the Sun” with Jennifer Jones, Gregory Peck and Joseph Cotten. The woman thought that Jesse, the good brother was a better choice for her but even though she said she hated him, she was attracted to the bad brother. And he knew it. Even though she attempted to fight him off, her body language made it clear that she wanted him and that was why he continued to make advances toward her. I have seen so many stories where women adamantly deny that they have feelings for certain men but in the end it turns out that they were just kidding themselves. I will admit that initially, I fought against my attraction for my husband because at the time I was in what I thought was a relationship. My husband was persistent. He was completely opposite to the man I was involved with and it wasn’t long before I ended my previous relationship. My husband told me that he once attended a party with an ex-girlfriend. A man approached her and she was chatting with him. Based on her body language my husband decided to get up and leave her there. He doesn’t know how she got home. That was the end of their relationship. Women who are in committed relationships have no business chatting with other men who can be very subtle in their approach. Not all of them make it clear that they are fishing. Some of them can be disarming so women have to be discerning. When you are around someone you may be attracted to, act as if your husband is right there beside you. Shut down the communication immediately. Let the person know that you are not interested in talking to him. Keep in mind that not all men who are friendly towards you are trying to score. They might just be trying to socialize and nothing more. You have to be able to know the difference and then respond appropriately. On a beautiful, warm January morning, a colleague and I were having breakfast in an outdoor coffee shop at MacRitchie Reservoir Park in Singapore. With a beautiful lake and immaculate gardens surrounding us and a light breeze blowing across the water, the setting was quiet, calm, and lovely. At a nearby table, a young woman sat quietly reading her Bible. She was absorbed in the text, occasionally looking up to consider what she had read. She never said a word, but her heart and priorities were visible to everyone at that coffee shop. It was a gentle, positive, silent witness. She was not ashamed of Christ or His Book. She neither preached a sermon nor sang a song. She was willing to be identified with the Savior, yet she did not need to announce that allegiance. In our attempts to share the message of Jesus, we must eventually use words, because ultimately words are needed to present the gospel. But we can also learn from the example of this woman. There are times when the quietness of our everyday actions speak loudly, revealing our love for the Lord. In our desire to share Christ with a broken world, let’s not ignore the power of our silent witness. Witness for Christ with your life as well as your lips. The best and most effective way to show that you are truly a child of God and a follower of Christ is by the way you live. Your conduct will convince others rather than what you say. As the old saying goes, “Actions speak louder than words”. (REVELATION 7:17)I love this “sighting” of Jesus. Up to this point in Revelation, He has been God’s Lamb, and He knows full well what it is like to be a lamb. He was led, as it were, as a lamb for slaughter, then mocked, beaten, and spit upon. The blows of sin’s fury fell on Him. His silent obedience and determination to fulfill the purpose of His coming was shocking. Hanging on the Cross, He bore our ungodliness in His own body. On that fateful day, as the sun refused to shine, the wrath of heaven against sin was unleashed on Jesus. He suffered and shuddered and finally died to set us free from sin and death. Jesus knows what it means to be God’s sheep. Our hearts must rejoice when we see, as John saw, that Jesus is not only the Lamb, but also the Good Shepherd. His total attention is on His flock (you and me!) as He leads them through the dark valleys and into springs of living water (Himself). May we who are both sinners and redeemed know the goodness of Him who is both sheep and Shepherd. Jesus knows the needs of His sheep because He Himself is God’s lamb. He gives His life for them. Today, a friend encouraged me to watch a video of her daughter Gabrielle. As I watched it, tears came to my eyes because I knew something of the challenges this mother had to go through but I also knew that she did not go through them alone. She had God, her husband and friends to help her get her through this. During this time, she kept a journal which has become a book called, Gabby’s Gift. This is a story that needs to be told. It is of a mother’s journey and a little girl who is a fighter and truly a blessing and a gift from God. I remember when this precious little girl was dedicated to the Lord. What a touching moment that was. I never knew about Spina Bifida until I met Gabby. Today, her mother is working tirelessly to raise awareness and to make a difference. Notes to Women celebrates Sharon Ennis, a strong, godly woman and mother of a beautiful little angel whose life is a powerful testimony of the love, strength and grace of God who loved and knew her even before she was born. We also celebrate Gabrielle who is a true champion. 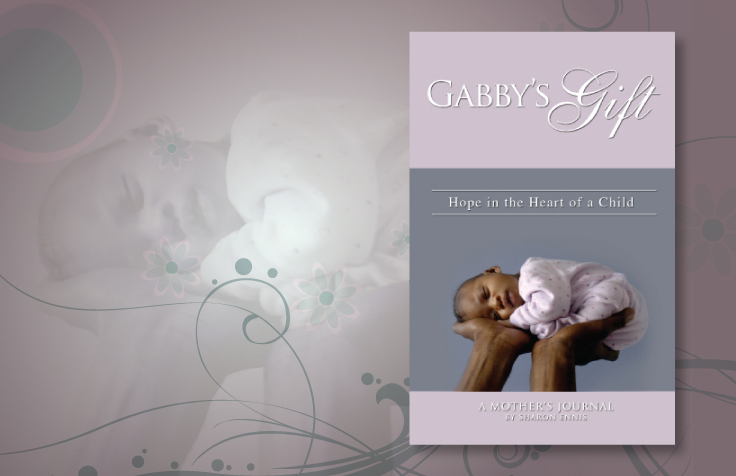 I encourage you to purchase a copy of Gabby’s Gift and read about hope in the heart of a child. It’s available at http://genesisonepublishing.com/. Before last night, I did not know that there was such an artist as Angélique Kidjo. She did a concert on PBS called, Angélique Kidjo And Friends: Spirit Rising. Her special guests included Josh Groban, Ezra Koenig, Branford Marsalis, Dianne Reeves, dancers from the Broadway show FELA! I didn’t get to watch the show because it was late and I had to work the next day but I heard her sing Summertime. It looked like a very entertaining show and I’m sorry I missed the powerful performances. Angélique comes a part of Africa, the cradle of civilization. she is the is a Grammy Award winning Beninoise singer-songwriter and activist from Benin. She is fluent in Fon, French, Yorùbá, and English and sings in all four languages; she also has her own personal language which includes words that serve as song titles such as “Batonga”. Malaika is a song sung in Swahili language. She often utilizes Benin’s traditional Zilin vocal technique and jazz vocalese. Her father is from the Fon people of Ouidah and her mother from the Yoruba people. She grew up listening to Beninese traditional music, Miriam Makeba, James Brown, Otis Redding, Jimi Hendrix, Stevie Wonder, and Santana. Miriam Makeba is a singer I remember hearing as a child. I think of her when I hear the woman singing the song from Lion King. It seems as if music was in her blood. By the time she was six, Angélique was performing with her mother’s theatre troupe, giving her an early appreciation for traditional music and dance. She started singing in her school band Les Sphinx and found success as a teenager with her adaptation of Miriam Makeba’s “Les Trois Z” which played on national radio. As a child I too grew up listening to different types of music and to this day I still have a great appreciation for it. However, unlike Angélique, I was not to become a singer. In 1983 Angélique relocated to Paris because political conflicts in Benin prevented her from being an independent artist in her own country. While in Paris, she studied music at the CIM, a reputable Jazz school in Paris where she met and married musician and producer Jean Hebrail with whom she has composed most of her music. Angélique has recorded George Gershwin’s “Summertime”, Jimi Hendrix’s “Voodoo Child” and The Rolling Stones’ “Gimme Shelter”, and has collaborated with Dave Matthews and the Dave Matthews Band, Kelly Price, Branford Marsalis, Robbie Nevil, Peter Gabriel, Bono, Carlos Santana, John Legend, Herbie Hancock and Cassandra Wilson. 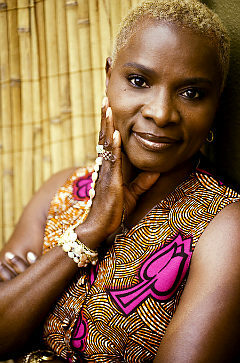 Kidjo’s hits include the songs “Agolo”, “We We”, “Adouma”, “Wombo Lombo”, “Afirika”, “Batonga”, and her version of “Malaika”. Angélique’s role as an advocate for change is very impressive. She has been a UNICEF Goodwill Ambassador since 2002. With UNICEF, she has travelled to many countries in Africa. Reports on her visits can be found on the UNICEF site: Benin, Senegal, Ethiopia, Tanzania, Syria, Malawi, Uganda, Kenya, Sierra Leone, Zimbabwe, South Africa and Haiti. She founded The Batonga Foundation. Batonga’s mission is to support both secondary school and higher education for girls in Africa. They do this by granting scholarships, building secondary schools, increasing enrollment, improving teaching standards, providing school supplies, supporting mentor programs, exploring alternative education models and advocating for community awareness of the value of education for girls. She has hosted the Mo Ibrahim Foundation’s Prize for Achievement in African Leadership in Alexandria, Egypt on November 26, 2007 and on November 15, 2008, in Dar Es Salaam, Tanzania on November 14, 2009 and in Mauritius Island on Nov 20th 2010. On September 28, 2009, UNICEF and Pampers launched a campaign to eradicate Tetanus “Give The Gift Of Life” and asked Angélique to produce the song You Can Count On Me to support the campaign. Each download of the song will donate a vaccine to a mother or a mother to be. Angélique has recorded a video based on her song Agolo and on the images of Yann Arthus-Bertrand for the United Nations SEAL THE DEAL Campaign to prepare for the Copenhagen Climate Change summit. The Commission of the African Union (AU) announced on July 16, 2010, the appointment of Angelique Kidjo as one of the 14 Peace Ambassadors to support the implementation of the 2010 Year of Peace and Security programme. Angelique appears in the Sudan365: Keep the Promise video to support the peace process in Darfur. She also supports the Zeitz Foundation, an organization focused on sustainable development and conservation. In June 2010, she contributed the song “Leila” to the Enough Project and Downtown Records’ Raise Hope for Congo compilation. Proceeds from the compilation fund efforts to make the protection and empowerment of Congo’s women a priority, as well as inspire individuals around the world to raise their voice for peace in Congo. In 2011, she collaborated with Forró in the Dark and Brazilian Girls on the track Aquele Abraço for the Red Hot Organization’s most recent charitable album “Red Hot + Rio 2.” The album is a follow-up to the 1996 “Red Hot + Rio.” Proceeds from the sales will be donated to raise awareness and money to fight AIDS/HIV and related health and social issues. She performed at many special concerts but I will mention only a few. In 2005 she appeared at the Africa Unite Live concert in Addis Ababa, Ethiopia, a concert to celebrate Hon Bob Marley’s 60th birthday, and was a featured speaker at the conference of African Unity held along with the concert. In March 2005, she appeared at the Africa Live concert in Dakar along with many great African stars in front of 50,000 people. On July 7, 2007, she performed at the South African leg of Live Earth. She joined forces with Annie Lennox and 22 other female artists to raise the awareness of the transmission of HIV to unborn children in Africa. On October 23, 2009, she sung at the United Nations General Assembly for the UN Day Concert, A Tribute to Peacekeeping with Nile Rodgers, John McLaughlin and Lang Lang. On December 4, 2009, in Cape Town, South Africa, she performed her song Agolo at the Final Draw of the Fifa World Cup 2010. And on February 15, 2010, Angélique performed in Vancouver for the Winter Olympics Games at the Place De La Francophonie. Today we salute this amazing woman for her music and her tireless efforts to make a difference in the world. Time Magazine deemed her “Africa’s premier diva”. Through her foundation, she promotes education for girls in Africa and through her travels in the world she inspires and empowers many. I still remember some of the things my father did when I was a child. He used to take me kite flying. He used to take the family on outings. I learned my appreciation for classical music, easy listening and classic movies from him. It was he who used to try to teach me how to fry an egg. He was the one who used to make sure that I ironed my school uniform and polished my shoes and meticulous about my hygiene. In many ways, he filled the role that should have been my mother’s. It was hard for me when my parents divorced. I still remember my mother asking him to stay in the marriage for my sake but he refused. It hurt at the time but in retrospect, it was for the best. I would not have wanted him to remain in an unhappy marriage for my sake. That would not have been fair to him. It would have been selfish of me. Years later, my father is living on his own. He and I don’t really keep in touch. I send him birthday, Father’s Day and Christmas cards every year. I can’t help but notice that he has never sent me a Mother’s Day card even though he has a grandson. He has never spoken to him. It hurts. I want him to acknowledge the wonderful little boy God has blessed my husband and me with. I want him to write and ask me questions about him. He is a loving, sweet, adorable, smart little guy. My mother adores him. He is her only grandchild. I wish my father would show more interest in him. He is the only grandfather my son has. I will not give up on my dream that one day my father will acknowledge his grandson. Until then, I will keep sending cards and providing him information to the questions he doesn’t ask about my son. I believe that even though your relationship with your father might not be what you hope it would be you should still honor him. You owe it to him and yourself to still fulfill your duty as a daughter. He is your father–he is the reason why you are here. Tomorrow, you celebrate him. Tomorrow I will be celebrating another father–my husband. Our son and I will make sure that he has a wonderful day. He had a early start this week when our son’s daycare treated him and other fathers to a Father’s Day celebration. The fathers got to hear how much their kids loved and appreciated them. Apparently our son told his teacher that his Dad’s favorite color is pink and that his favorite food is chicken and rice. He left out the peas. My husband is Jamaican and he loves peas with his rice. Someday, Dad, my hand will grow just as big. And someday I’ll be as old. But until that day I’m just so happy to have your hand to hold. HAPPY FATHER’S DAY. My husband enjoyed spending time with our son at the daycare and meeting other fathers. It is good that one day every year is set aside for fathers. Sometimes, I think that they are not appreciated enough or that their role in our lives is downplayed. Fathers play a crucial role in the lives of their children. All kids have a little bit of the thespian in them so help bring out their inner actor with a special play just for dad! Create a funny or special story about how important dads are. Maybe there’s a particular “dad moment” that the kids want to recreate. Whatever you do, be sure to give dad the best (and comfiest) seat in the house. And then sit back and enjoy the show! Going out for a nice family dinner can be very enjoyable. Since it’s his special day, let dad pick out the restaurant. However, if you have young children who don’t appreciate fine dining and would rather spend their meal running around screaming, eating indoors may not be as pleasant as you would like. But don’t try to hinder your children’s energy. Instead, get a meal to go or make a picnic and head outdoors. Enjoy the day together as a family free from telephones, televisions and computers. Soak up the sun, play a game of catch, go for a walk and run around with your kids. Make dad work for his Father’s Day presents this year by hiding them around the house. You and your kids can create a treasure hunt, complete with clues, ahead of time. Then, before dad wakes up on Father’s Day, set up the hunt. Don’t forget to throw in a few red herrings to keep dad on his toes. Many charities hold special fundraising events on or around Father’s Day. If there is a particular organization that is important to Dad or your family, then get together and participate in a charity walk to help raise money for a good cause. This is not only a great way to give, but it also helps to raise your children’s awareness of social causes. People may be gone but that doesn’t mean they are forgotten. If your or your partner’s father or grandfather has passed away, then plan a trip to his grave on Father’s Day. Buy some fresh flowers that your children can place on the grave. Share stories of your favorite moments with dad or grandpa with your children and remember the words of poet Anne Sexton this Father’s Day: It doesn’t matter who my father was; it matters who I remember he was (Source: http://www.itsamomsworld.com/moms_room_seasonal_fathers_day_tips.html). Notes to Women wishes the men in our lives a Happy Father’s Day!! !